The Gold Coast's Women in Business Breakfasts provide a platform for like-minded women to come together and connect, share and be inspired. Anyone can attend our events! "The women in Business Breakfasts are without doubt the best way to start your day, you feel like you are part of something bigger that just you and you leave feel feeling empowered and inspired- I just love being part it!" 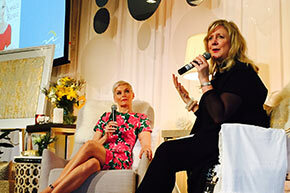 Early Risers is managed by Karen Phillips Corporate Communications, and is the largest Women in Business Club in QLD. The intention of the Club's events, along with the networking and business connection value, is to raise funds through raffles with proceeds going to SIDS and Kids Queensland. 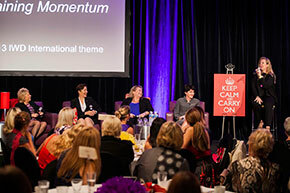 Celebrating 22 years, and as one of Australia's largest women's networking organisations, the Club's five-star Women in Business Breakfast events are based on an edu-tainment format. An action packed 1.5hr program of fun, education, entertainment and networking, the program is entwined into a highly successful formula which creates a unique and extremely successful live-show style event. The events are open to both members and the public. The Early Risers Women in Business Breakfast monthly breakfasts feature nationally and internationally acclaimed keynote speakers including international guests Jane Fonda, Kathy Lette, and Olivia Newton-John as well as Australian icons including fashion legends such as Carla Zampatti, Charlie Brown, June Dally Watkins, and celebrities including Shane Bourne, Wendy Harmer, Terri Irwin, and Tara Moss, Lisa McCune, Catriona Rowntree, Ita Buttrose, Ray Martin, Shelley Craft and Shaynna Blaze. This unique concept designed with women in mind, provides a platform for the leading woman of the city to reap the rewards of a mutually beneficial networking group.